Exclusion has come to hold a prominent place in the political discourse of all governments in the European Union and in the European Commission itself. As such, it figures importantly in various research agencies’ funding priorities attracting academics to develop and conduct major research programmes. But what does it mean? 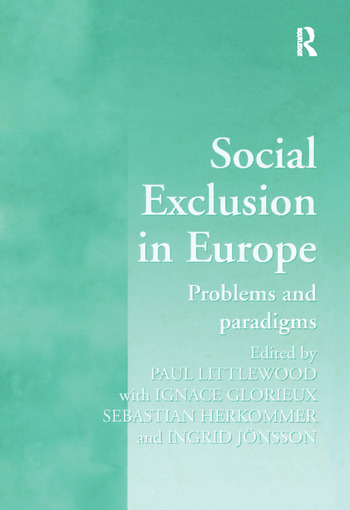 This book analyzes the different meanings the term exclusion has come to convey and surveys a wide variety of actual applications in different European countries. Contents: Identifying social exclusion: some problems of meaning, Paul Littlewood and Sebastian Herkommer; The end of the full employment society: changing the basis for inclusion and exclusion, Georg Vobruba; Social exclusion and the flexibility of labour: a theoretical exploration, Gerrit van Kooten; Paid work - a crucial link between individuals and society? : some conclusions on the meaning of work for social integration, Ignace Glorieux; The underclass - a misleading concept and a scientific myth? : poverty and social exclusion as challenges to theories of class and social structure, Sebastian Herkommer and Max Koch; Women, work and welfare, Ingrid JÃ¶nsson; Ideas of social justice in the welfare state in Germany and The Netherlands, Roswitha Pioch; Stigma and non-take up in social policy: re-emerging properties of declining welfare state programmes?, Staffan Blomberg and Jan Petersson; Schooling, exclusion and self-exclusion, Paul Littlewood; Citizenship and exclusion in the European Union, Mike McGuinness; The socio-cultural exclusion and self-exclusion of foreigners in Finland: the case of Joensuu, M'hammed Sabour; Index.